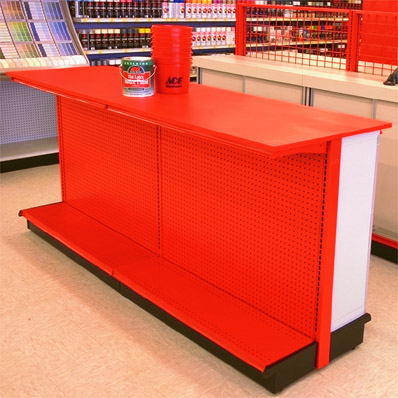 The assembly of our Commercial Store Counter System is composed of Gondola Shelving section with a Counter. If you place upper shelves on the very top row of inserts on the Madix Gondola Uprights you will see that the top shelf is perfectly flat and you will notice that a flat Counter can be placed over the top of the shelves and it will sit flat. We have available a wood construction countertop with top surface and edgework finished in choice of laminates. Available in widths from 8" to 48" and lengths up to 8' in one piece. Longer countertops are joined at job site by combination dowel and “tite-joint” method insuring a smooth surface. Brackets are not included. 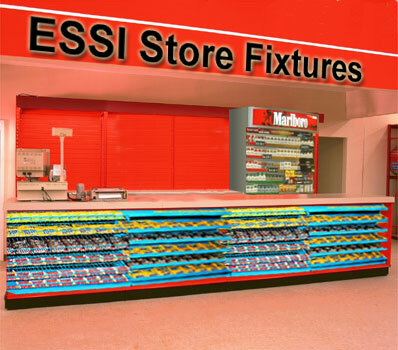 One pair of shelf brackets or upper shelves are required for each shelving section to mount the couter top onto..
Gondola Countertops are great for a Convenience Store, Gas Station, or Liquor Store cash register counter that will also display small products such as Candy, Beef Jerky, Potato Chips, and also Counter Spinners on the top of the countertop. Countertops can also be mounted on to the top of regular store shelving and the countertops are not proprietary to our shelving. This means you can use any type of countertop and mount it right on to the top of any existing Gondola Island Shelf. Three different countertop types available. 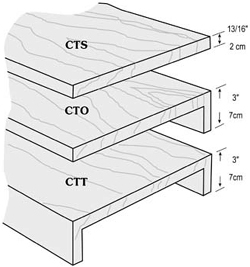 Flat (CTS), single edge (CTO) and double edge (CTT). Choose from all types of different laminates. 1 Countertop CTT Section 40" wide by 4' long would cost $52.00 X 4 Lineal Feet =$208.00. A heavy gauge bracket specially designed to support countertops shown above. One pair is required for each section. Order brackets 2" shorter than countertop. Countertops can also be mounted on to the top of regular store shelving and the countertops are not proprietary to our shelving. This means you can use any type of countertop and mount it right on to the top of any existing Gondola Island Shelf.